Just to continue our previous post on the controversy, Stefano Gabbana and Domenico Dolce have personally issued an apology through a video uploaded on weibo. The same video has not been uploaded on Twitter and Instagram. DD: In the past few days, we have reflected on ourselves. On what our words and actions have brought upon the Chinese people and their country, we are deeply sorrowful. Our family upbringing taught us to be respectful of other cultures. On our distorted understanding of the culture, we hope to receive your forgiveness. SG: We place great importance on this apology. Here, we formally offer our deepest apologies to all the Chinese people in the world. DD: All along, our love for China has been the same. Numerous visits have increased our love for Chinese culture. Of course, we have many areas to learn. On the mistakes in what we have previously conveyed, we must give our apologies. SG: We will not forget this experience and lesson. This will never happen again. At the same time, we will do our best to better understand and respect Chinese culture. Lastly, we sincerely request for your forgiveness. The apology comes a bit late and the Chinese public does not seem to be buying it. Here are a couple social media accounts covering this that you can check out: c-drama tweets and Trending Weibo. 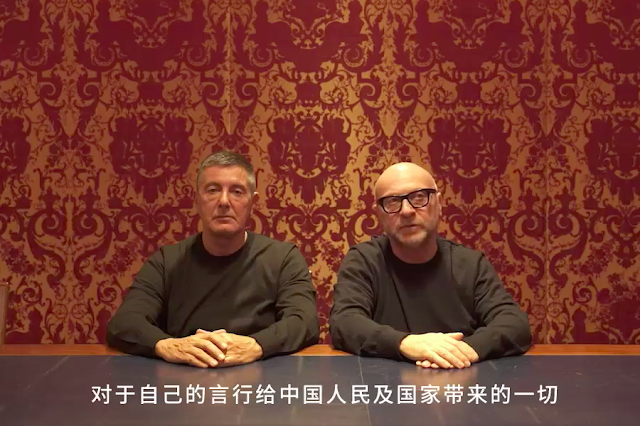 Update: The apology video was later uploaded on the rest of D&G's social media accounts. They are only sorry because it is affecting their bottom line ($$$$). LOL says they are sorry but only posts on Weibo. Says they were hacked and now they are pretending it never happened and he made a mistake. The racist AD is apparently still up on their official social media except Weibo. So sure they are very very sorry. Not only will China never sell their products again, Chinese people from other parts of the world won’t be buying their products. I hope Americans and others follow suit since it’s not the first time they made rude, and derogatory marks about people. I’m glad China called them out instead of how other people just let it slide when they made rude comments about others. past, they often made rude and disagreeable comments especially towards Italian people. So, it is not that they are racists, they just thinks they can say whatever they want because they are rich and powerful. I must say, though, that the condemned Chinese spot is not so different from a regular Italian spot, full of cliché but not so much vulgar that all China should take offence. Of course, after Gabbana said inexcusable comments but that's another story. Oh so NOW they are apologizing. They were shook when they realised the Chinese were not playing and their bottom line is going to be decimated.